Every so often a company will contact me asking if I'd like to review one of their products. It's sort of difficult to review things other than books on a website entitled "Reading to Know" but from time to time I've found a product that I'm really interested in looking into further. So, no, this isn't ye olde book review today. This is a personal post telling about a product we were sent for review. Of course, if you are interested in this item for yourself, read on! We live in Oregon where it rains and snows. We built our (log) house a few years ago but, as is usually the case when you build, there's always something about the house that you didn't think through very well and would change if you could. One of our chief regrets post-building was that we didn't think to include an entry ramp up to our front door. The one and only way to get into our house is up a small flight of stairs. 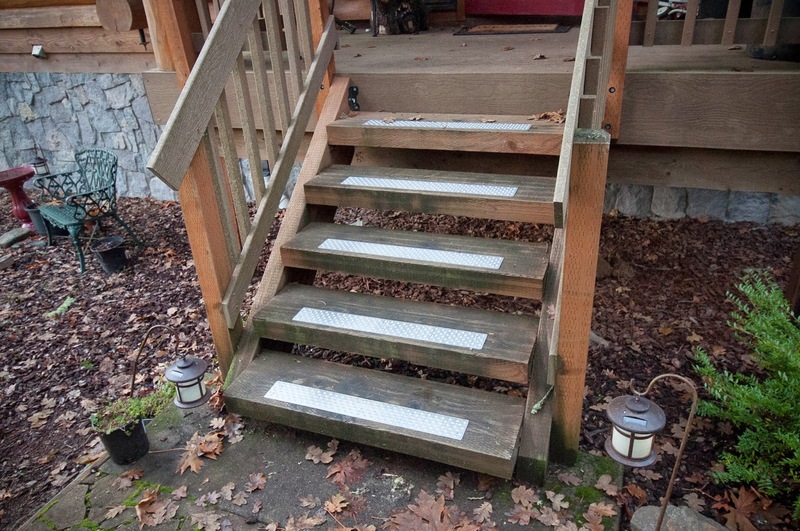 The unique construction of Handi-Treads provides the best slip, trip and fall prevention. Its raised button surface grips on to your shoe or foot and provides instant traction, which no other company can offer. Furthermore, Handi-Treads are lightweight, consume just seconds to install, and look quite attractive. They are the ideal cost-effective solution because they are more durable than non slip grit tape and grip paint and will not need replacing. 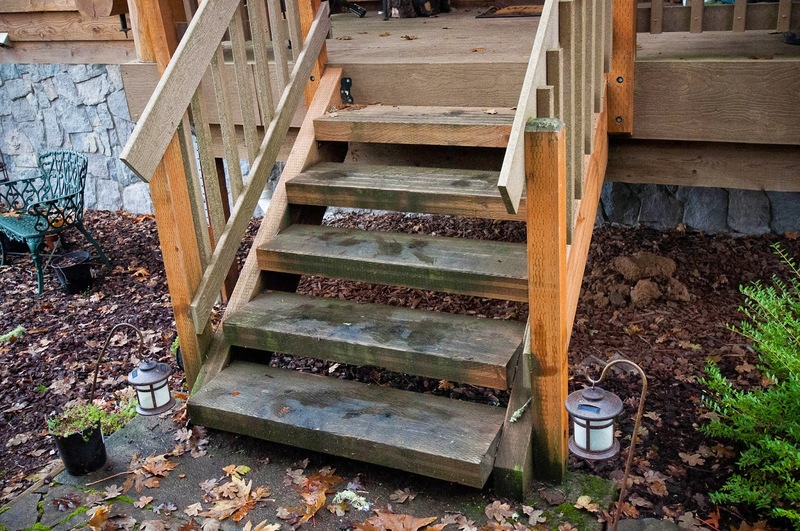 Also, because our treads are made of aluminum, they won’t rust or corrode. Jonathan and I both poked around their website and their treads looked promising in possibly offering a solution to our problem. We agreed to try them out in exchange for a review. The texture on the treads does a good job of preventing slippage while not being so rough as to scuff up your shoes or stick up with a height that's uncomfortable to walk over. They are indeed lightweight and, in our opinion, do look attractive. The way things look against or on our house is very important to me. I don't want something industrial looking attached to our more rustic log house. Although the treads that they sent to us were silver instead of brown, in the end I was glad of that because it alerts guests that there is something there for them to step on and help them to stay safe. To me, the color is not as visually distracting as I feared; it works well, considering the problem these treads are designed to solve. Since installing the treads, we've experienced a lot of rain but no freezing temps. The UPS man has come several times to the door and has not made any additional complaints. We've noticed that walking down the steps feels safer as the treads offer your feet a nice grip, helping one to safely navigate them. 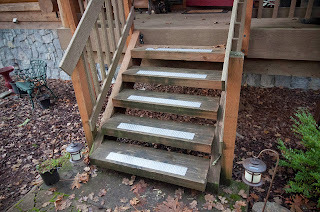 We would buy Handi-Treads again in a heartbeat if we needed them for a similar situation, being very pleased with the result. Highly recommended by my husband and myself! Many thanks to Handi-Treads who sent samples our direction in exchange for facilitating this review. We received no additional compensation and all opinions are 100% our very own. As Daniel and I prepare to build our own house sometime in the near-ish future, it's interesting to hear what other people have learned from their own home-building adventures. I might have to pick your brain at some point here!